Chris Carlson is a professional 3D chalk artist based in Denver, Colorado. Chris travels all around the country creating mind blowing street art. 3D chalk art is a great way to create excitement and drive audience interaction for any event. People will pose for photos with the amazing 3D artwork and share them on social media, expanding your brand’s reach. Whether you are looking for a professional chalk artist in Denver, or anywhere in the world, Chris can deliver the excitement and audience engagement to take your project to the next level. Contact Chris now to learn more about 3D street art. People can pose with artwork that shows them plummeting off a cliff or wrestling with a shark. These memorable photo opportunities will set your event apart, and are widely shared on social media. This ensures that your marketing efforts reach far beyond the initial event. Chris can create a custom design for your brand to fit your space and your message. Chris can create 3D artwork using chalk or paint. He can create the artwork on the ground or the wall, or both! He can paint directly on the street or sidewalk, or on a moveable surface like vinyl or canvas. No matter what your needs, Chris can put together the perfect design to engage your audience. Chris has devoted the last 10 years of his life to studying anamorphic 3D street art. He has learned the perspective tricks of the masters who came before and added some of his own innovation to the artform. Chris understands the elements that are important in creating amazing 3D artwork. Everything begins with the concept. Chris will create a custom design to perfectly fit your specific concept needs. He is known for his unique interactive designs; creating exciting photo opportunities for people to interact with the artwork. Chris combines realism with playfulness and humor to create unforgettable designs. His unique style is immediately recognizable and will help set your brand apart from the competition. Over the years Chris has developed an exciting and unique style of 3D chalk art. His style combined with his masterful execution makes for truly attention grabbing artwork. People passing by will stop to admire the artwork and pose for photos. Your audience will tell their friends and family about this unique chalk art experience. 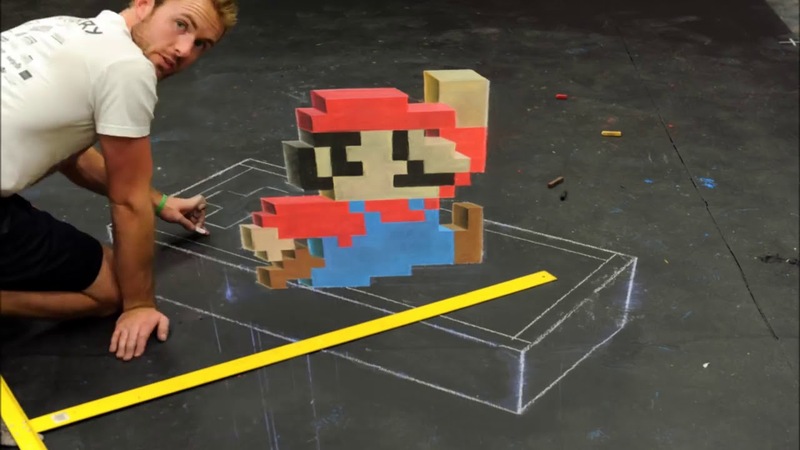 Chris has created stunning 3D chalk art all around the United States and Europe. Videos of his artwork have been shared and viewed over 10 million times on YouTube and social media. Contact Chris now to begin the conversation about how chalk art can enhance your marketing efforts. Chris travels all over the world creating artwork for clients of all types. His artwork has been featured at video game conventions in Paris. His videos have been shown on Japanese game shows. He has been featured in art festivals all around the United States. All of this experience has given Chris the ability to adapt to any situation or project. He can create huge murals or small canvas paintings. Whatever your specific needs, Chris has the tools for the job.